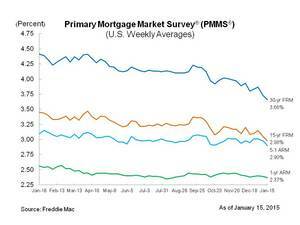 MCLEAN, VA--(Marketwired - Jan 15, 2015) - Freddie Mac (OTCQB: FMCC) today released the results of its Primary Mortgage Market Survey® (PMMS®), showing average fixed mortgage rates falling for the third consecutive week as bond yields continued to drop despite a strong employment report. Averaging 3.66 percent, the 30-year fixed-rate mortgage is at its lowest level since the week ending May 23, 2013 when it averaged 3.59 percent. This also marks the first time the 15-year fixed rate mortgage has fallen below 3 percent since the week ending May 30, 2013. "Mortgage rates fell for the third consecutive week as oil prices plummeted and long term treasury yields continued to drop despite a strong employment report. The economy exceeded expectations by adding 252,000 jobs in December which followed an upward revision of 50,000 jobs to the prior two months. The unemployment rate fell to 5.6 percent which was the lowest since June 2008."